Too many birders hang their binoculars up and put their field guides back on the shelf after May, fearing the “dog” days of summer. But the summer months offer a great opportunity to get to know your local nesters. While it’s true that rising thermometers, incubation and chick-rearing duties quiet and/or shorten the morning chorus, early morning still offers a great deal of avian activity. And here in Western North Carolina (WNC) we’re fortunate to have the Blue Ridge Parkway, the Cherohala Skyway, the Great Smoky Mountains National Park and other avenues to race those rising temperatures up the mountains and prolong those good birding opportunities. Last Saturday (June 18) I had the pleasure of leading a field trip for the Great Smoky Mountains Audubon Chapter to look for local nesters. The disparate elevations across WNC not only allow you to chase cooler temperatures they also provide different birding opportunities. We started out last Saturday at Kituwah along the Tuckasegee River in Swain County. The area, formerly known as Ferguson’s Field, is home to the Kituwah mound and revered by the Eastern Band of Cherokee Indians as the “mother town.” The EBCI purchased the mound and 309 surrounding acres in 1996 to preserve the site. Tribal members farm small plots on the site. Kituwah is open to the public from sunup to sundown and birders are welcome. Kituwah’s open areas and brushy fence row habitat offers a chance to view different birds than one would encounter along the Blue Ridge Parkway. The purple martin colony, near the entrance to Kituwah was busy when we arrived Saturday morning. Tree swallows, barn swallows and chimney swifts joined the martins in the sky chasing insects. We also got a brief glimpse of a blue grosbeak along the railroad track near the entrance. We started out along the railroad tracks and were shortly greeted by the “fitz bew” of a willow flycatcher. The wet brushy habitat at Kituwah is ideal for these little flycatchers. A pair of noisy, curious blue-gray gnatcatchers also greeted us along the tracks. We were observing eastern bluebirds and listening to yellow-breasted chats and common yellowthroats near an old barn along the tracks when the sky suddenly filled with barn swallows. A glance up showed the reason for all the excitement as the swallows escorted a male Cooper’s hawk out of their territory. We never did get looks at a chat, although we heard at least three. Another noisy brush-denizen that sang and sang for us while remaining hidden was a white-eyed vireo. We did, however, luck out on another Kituwah resident. We were skirting a cornfield along a turn row, when a short burst of song stopped us. 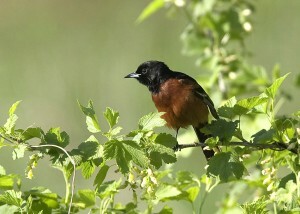 An orchard oriole popped up into the top of a small tree and gave us great looks – singing all the time. We were beginning to work up a sweat at Kituwah so we abandoned the lowlands for the coolness of the Blue Ridge Parkway. It was a little after 11 a.m. when we stopped at the Big Witch Overlook for lunch. As we were sitting in the cool shade, first a black-throated blue warbler, then a chestnut-sided warbler came over to check us out. At Jenkins Ridge we were serenaded by a brown creeper but never got looks at the little tree hugger. We did get great views of a Canada Warbler and a pair of common ravens, though. Darkening skies spurred us on along the Parkway to Heintooga Ridge Road. We picked up a ruffed grouse with at least one fledgling and a pair of hen turkeys with a whole herd of polts along Heintooga. At the Balsam picnic area, at the end of Heintooga road we heard golden-crowned kinglets and saw red-breasted nuthatches. The rain overtook us and we headed back to Waynesville with around 60 species. Not bad for the “dog” days of summer.